Yes i know people will think its a waste, but the way this car was was a waste, so please don't start with the negative comments it is getting from a few people whinging on other sites. I know its not everyones cup of tea, but I love it. And it gets far more attention than any other car on the road. 20k need to move it on. Baby is nearly here. I'm not looking to buy your car, sorry. However, have you advertised the car to U.K. air cooled guys and girls? 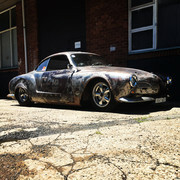 Sites like Rothfink ( http://www.rothfinkindustries.com ) would love your car. Hope everything goes well with the birth of child. Putting subaru engines in bugs doesnt take rocket appliances....just abit of denial and error! Yeah still for sale. Shoot me a pm if interested. Wife is putting the foot down.